Jaun Carlos Callan (pictured left) and Jeanette Vigil attend the Annual Mortgage Assistance Fair. 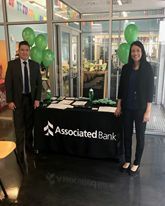 On March 30, several Associated Bank colleagues from the Rogers Park community dedicated their day to teach financial education to students and community members. In the morning, Associated Bank’s Kevin Greer, residential loan officer-CRA based, George Gojnea, in-store assistant manager, and Juan Carlos Callan, bank manager, gave “Banking 101” presentations during the Chicago Math and Science High School career fair targeted to over 135 juniors and seniors. The presentations covered the banking industry as a whole and job opportunities at Associated in an effort to motivate students to start thinking about their future professions. Callan and Jeanette Vigil, residential loan officer-CRA based, also attended the Annual Mortgage Assistance Fair held at the La Casa Resource Center in the afternoon to help low-income families in the community learn about mortgage assistance programs. They gave presentations on Associated Bank’s mortgage services and financial education tips for credit building, budgeting and saving for the future. More than 90% of the attendees were Spanish-speaking, allowing Callan and Vigil to use their bilingual skills to present in both Spanish and English.